Almost 2 years ago (Wednesday 17 March 2004) Prindiville's handling of a request to hold the funeral of Aboriginal Elder, Betty Roberts, led one of her daughters to ask "Wasn't that terrible? Is he always like that?" A couple of Sundays ago (26 February 2006), Jonathan was delivering a thoughtful reflection on the day's readings while Prindiville and a seminarian sidekick sat on their thrones behind the altar. An obviously distraught Cindy, one of the Koori regulars, approached the Neocat priest with hands outstretched; he shooed her away awkwardly. She then tried the seminarian, who refused to move his arms which were folded across his chest in prayerful supplication. Cindy had come to ask the community to pray for her brother Dwayne, in hospital with cancer. The Neocat response was rejection. During the Prayers of the Faithful Len expressed his sadness at this racist display, and prayed for the Spirit to descend upon Prindiville and his cohorts to open their hearts. At the end of Mass, Alan tried to raise the issue of planning for the Message Stick (see Brisbane Archdiocese welcomes Message Stick); Prindiville refused to engage in any discussion and hurried from the altar. 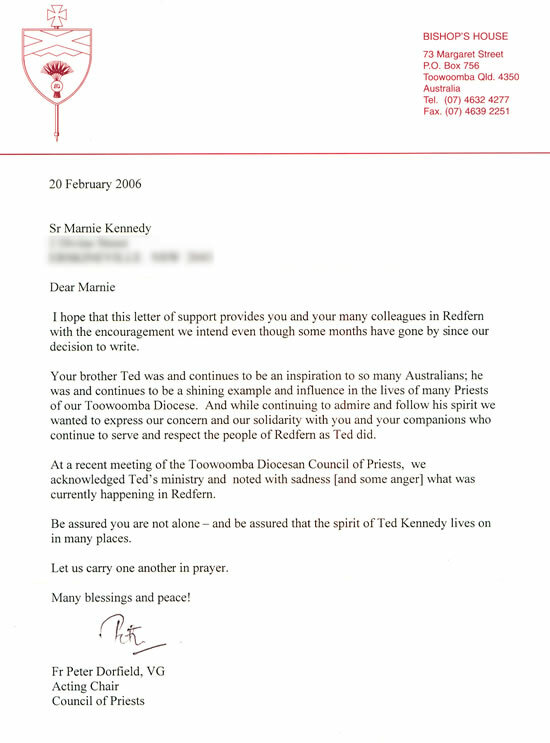 When Tom followed him into the sacristy to query his behaviour, the caring pastor responded with utterances about "bloody Aboriginals". The community continues to await the descent of the Spirit. 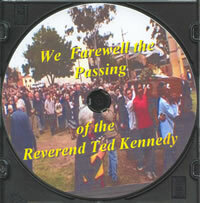 The video of the celebration of Ted Kennedy's life is now available. Over 7 hours of professionally shot video of the occasion have been edited down to a moving 78 minute tribute to our dear friend. Email bintu@dodo.com.au to order a copy.